A small entry door or gate, most often set into a much larger gate or door, or set close by to a larger gate. Also called a wicket gate. 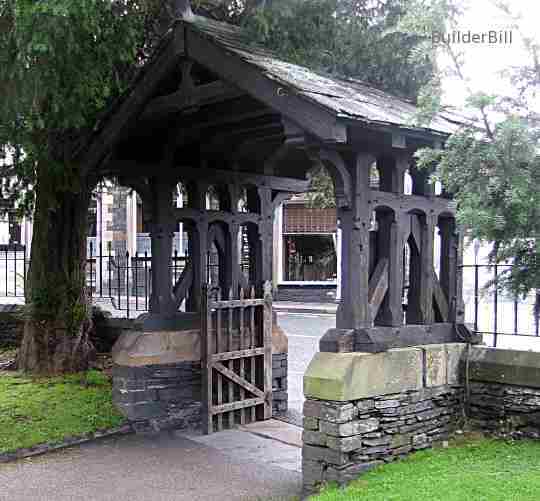 A roofed entrance gateway to a churchyard or cemetery. A building enclosing or attached to a gateway to a far larger building. 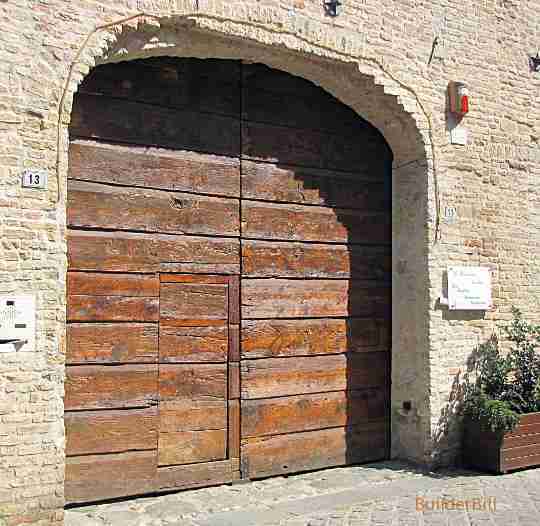 A heavy defensive vertical grating of iron or timber set into a fortified gateway..
Gates: A small modern steel gate. Here we have the results of an architect trying to make a statement. Frankly it does not do much for me, with it's over the top detailing for such a small thing, but it is here to show a detail that used to be very common on large old timber gates before welded steel made large timber doors obsolete. 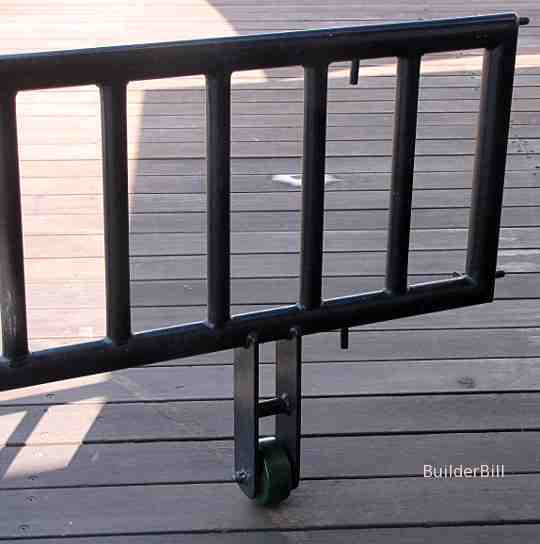 Gates: A roller to support the overhanging end of the door. These used to be a common sight on old timber doors and they are still used on large steel swinging gates to warehouse yards. This one is rubber faced because it is rolling on the timber decking, but steel rollers on concrete surfaces often have curved steel plates set into the concrete to help them run smoothly. Wicket Gate: An old timber set of double doors. The larger doors are there to allow the passage of heavy goods and vehicles, but the smaller door or wicket door is there just to let foot traffic through. This is not only easier but it makes the locking of the two sets easier. This type of small building is common to old country churches. They were built for shelter of pedestrians, but also as a stopping place for the coffin before proceeding to the grave site. This particular one seen in the English Lake District is not as ornate as most, many of them have seats at the sides, but it has a honest solidity about it that will no doubt see it standing for many years to come. 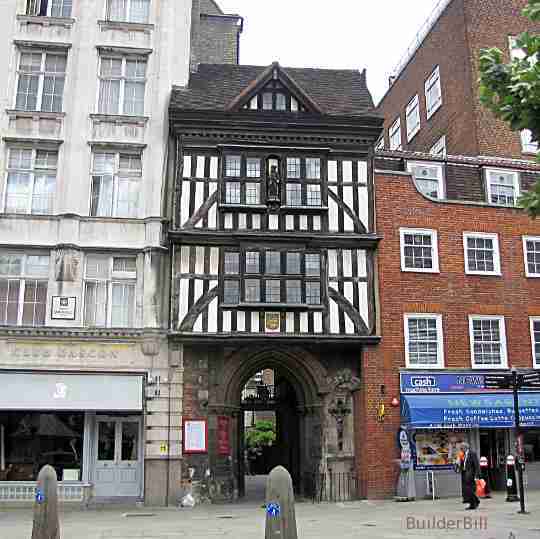 Gatehouse: The gatehouse to the Priory Church of Saint Bartholomew The Great in London. Close by St.Barts Hospital in central London the old walls of the 12th century churchyard have been taken over by modern development, leaving just the opening in the wall and the gatekeepers house over it. These buildings were and still are a common feature to large properties that have their own grounds and are grand enough to warrant the presence of security staff. They were a good idea in medieval times and it seems they are still needed today. 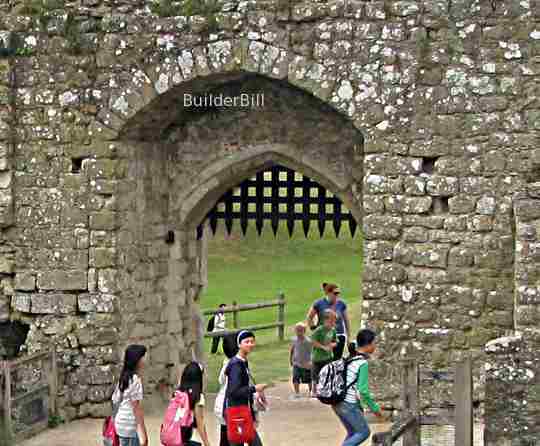 Portcullis: Seen at Leeds Castle in Kent, England. This portcullis is in an outer wall that was just one of many layers of defence. It is outside the castle moat which in the old days would have been fitted with a drawbridge. To the best of my knowledge it was never used in anger, but no doubt it served it's owners well as a deterrent.